In my family we always celebrated St. Nicholas' Day by putting our shoes outside the front door and the next morning we would find a small gift in them, usually some quarters or a candy bar. In Handsomepants' family, they opened their Christmas stockings (wierd, I know!) And this was a tradition that Handsomepants wanted to keep in our house. 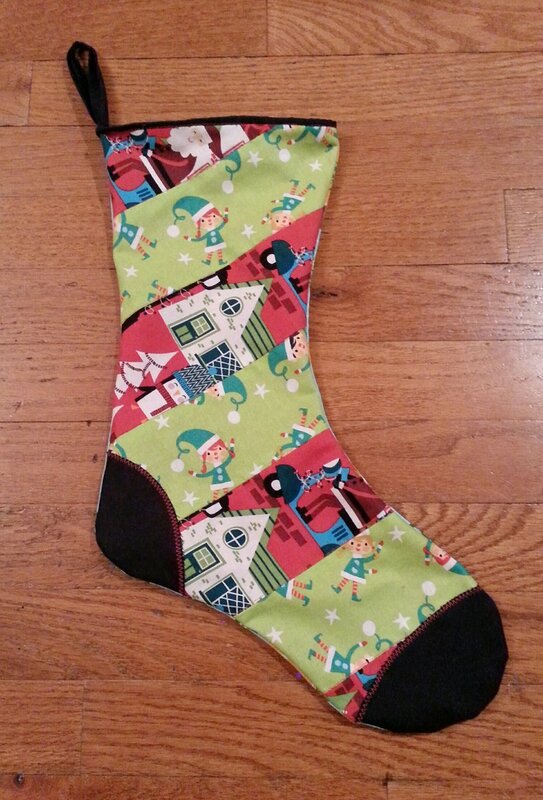 We had a mish-mash of stockings that we had had growing up or bought, but we didn't have one for Little Man this year, and shopping for Christmas stuff just isn't my thing. So I decided to make some new ones for everyone in the family. Since I had finally finished the tree skirt I started two years ago (there is no excuse for that) I decided to use the mass of left over fabrics from the skirt. I decided a cohesive look for our Christmas decorations would be nice, but I didn't want things to be identical. 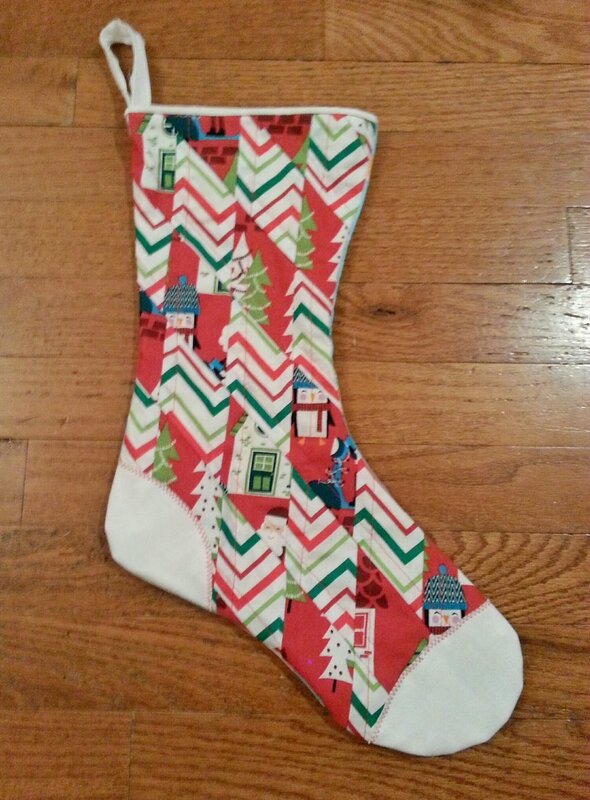 All five stockings use the same fabrics that I used for the tree skirt, but they all have different patterns. I also used the same backing fabric for the skirt and stockings. It felt like a bit of cheating to use a solid back, but I'm the queen of self-sabotage when it comes to starting projects late, so having stockings done on time for St. Nicholas' Day was a bit of a rush. 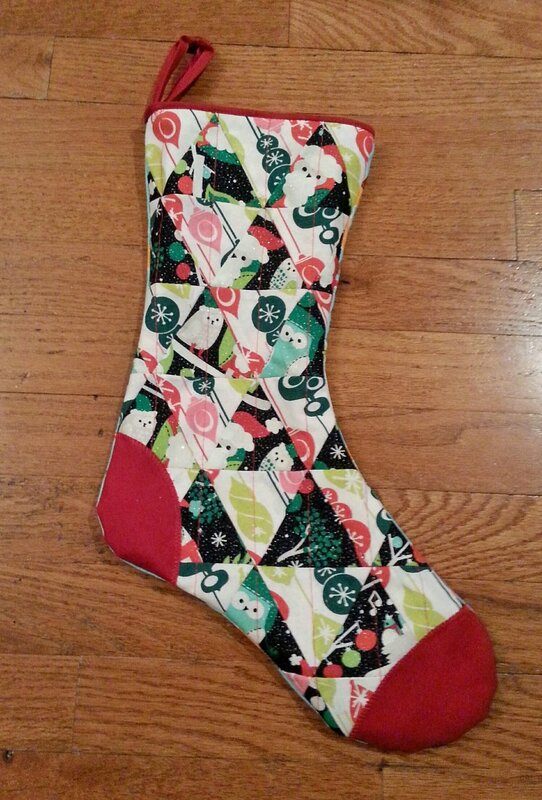 I had never made stockings before, so I sort of winged it and the results turned out better than expected. 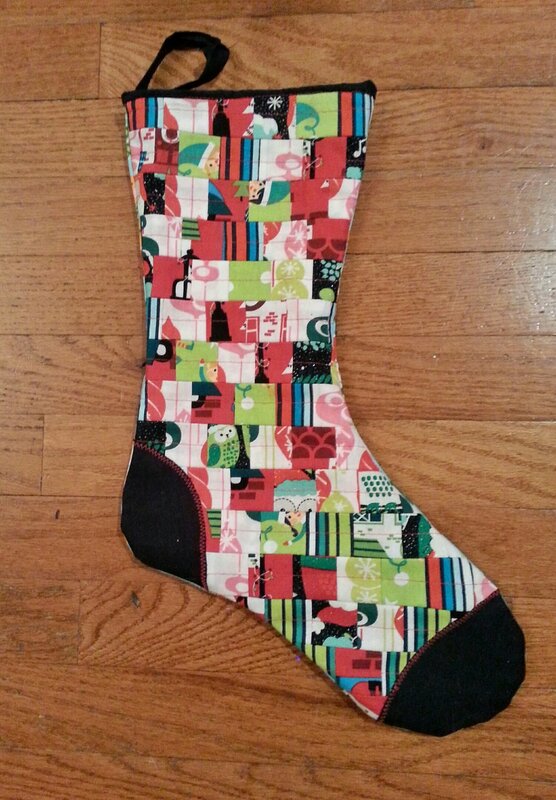 I drew out templates on freezer paper for the stocking and the toe and heel patches, and used those three templates for all five stockings. If you're unsure about free handing your template, you can also trace a stocking or sock you already have, and adjust the size accordingly. Also, important to note, I added the seam allowance to the templates so that when I cut out my fabrics, I cut as close to the template as I could. If you forgot to add seam allowances, add them when you cut your fabrics. The tops of the stockings were quilted with a middle layer of fabric, I just picked some random fabrics I knew I wouldn't otherwise use for a while. No body really looks at the inside of a stocking. I don't know if this step was absolutely necessary, but I didn't want any stitches or fabric ends to come undone. The quilting wasn't anything exciting, just some top stitching along seam lines. Then the toe and heel patches were appliqued on. The backing and the top of the stockings were then placed right sides together and sewn together with a tight stitch and a 1/2" seam allowance. 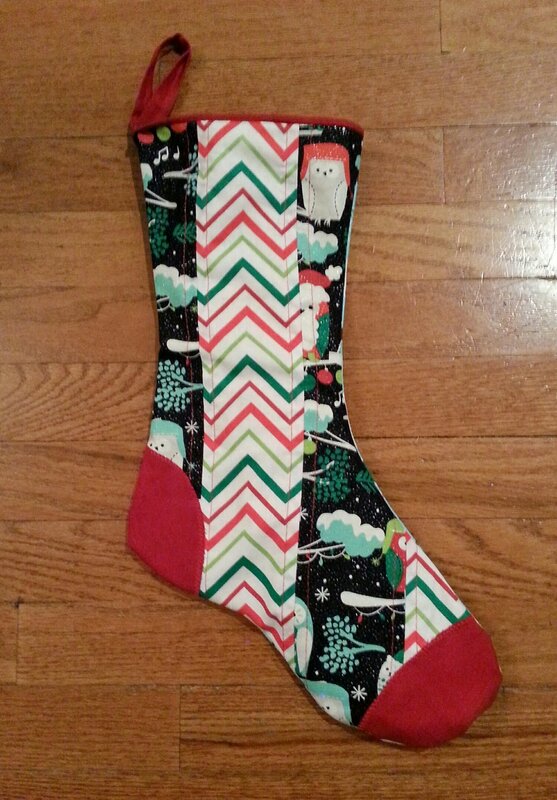 The stockings where then turned right sides out and finished with a traditional quilt binding. I did use about 4" of the binding as a loop to hang the stockings on our mantle. Needles to say, I think the stockings turned out pretty nice. I also cut a couple spare backings to have on hand in case I make more in the future, because who am I kidding, we're gonna have some more kids. I thought it would be nice to plan ahead! The kiddos had a blast opening the stockings that just magically appeared over night. The girls spent all day playing with some new play dough, crazy socks, bubbles, and Santa-style suckers. Little Man got lots and lots of chocolate, but since he's only 2 months old I had to help him eat it, what a shame! 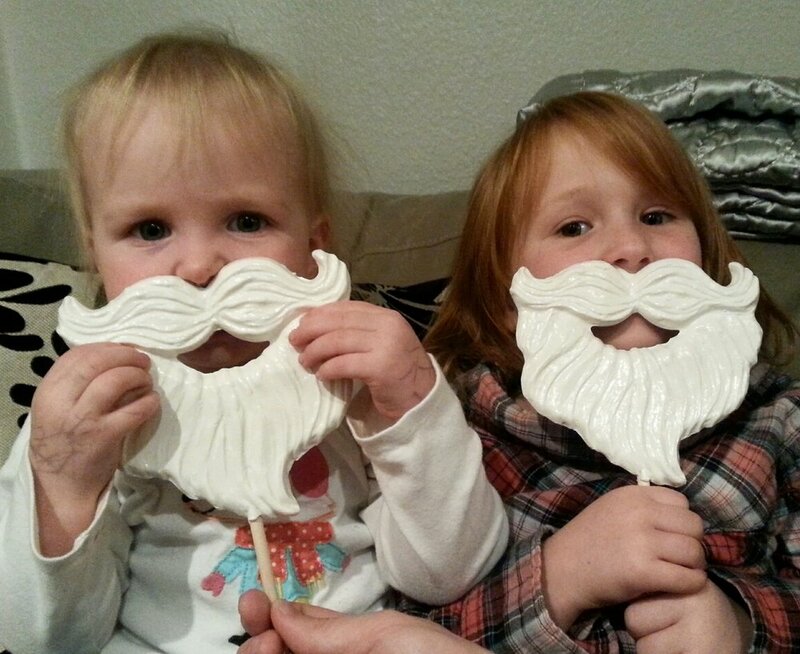 Who knew Santa's beard tasted like fruit punch.